You've probably started making your summer reading list by now. If not, you still have plenty of time. If a paperback copy of More than a Moment would look at home on your bookshelf, simply click on the Goodreads giveaway link below to learn how to enter to win a paperback copy. These beauties are lined up on my shelf - ready to land on your summer reading pile. I'll be sending out three copies. One to each winner that Goodreads selects for me. The giveaway is open to readers in the US only. Giveaway ends June 12, 2016. 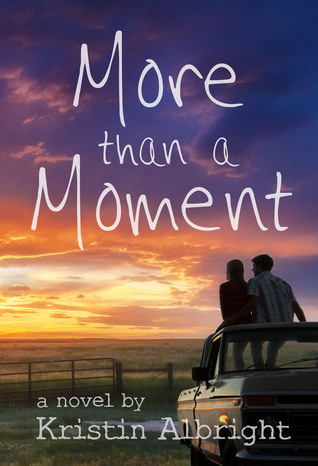 YA fiction novel / More than a Moment / Now available! After months of editing, revisions, and formatting, release day is finally here! More than a Moment is a sweet YA love story set in rural Wisconsin. I have been assured by my advance review copy readers that it is a perfect beach read. At least for now, More than a Moment will be available exclusively on Amazon. Paperbacks will be coming, but aren't ready quite yet. If you read and enjoy More than a Moment, please consider leaving a review on Goodreads or Amazon to help others find the book. As always, feel free to say hi through email or facebook. I love hearing from you! I really need to get better at juggling my workflow. Somehow I ended up with all three of my completed manuscripts out to beta readers and my editor at the same time. This would have been perfect if I hadn't run out of Parenthood episodes to watch on Amazon prime, BUT somehow, the two coincided. While I wait for my name to creep up the hold list at the local library, I'm taking some time to update a few things on my website and start on marketing materials for the new releases. I have preliminary designs for all the book covers and am working on the back cover blurbs. NANOWRIMO, a November of Silence, and a teaser from my newest novel! How is it almost Christmas? I've already been feeling like life has been passing by in warp speed, but I think Nanowrimo (National Novel Writing Month) made November go even quicker. The good news? I wrote over 50k words in 25 days and have a brand new manuscript saved on my computer. I wrote with an outline for the first time and the experience was awesome. I felt like I was able to keep a good eye on the arch of the story without being constrained creatively. The book was really fun to write, and I hope will be equally fun to read. I'm forcing myself to stay away from it for a little while, but as you can imagine this is hard. Instead I'm working with my beta readers on Totem and Summit. I still want to get those books polished and published next, and then I will pay more attention to my newest book baby. But just for being awesome readers, here is a little teaser from my Nanowrimo novel - which will be titled More than a Moment. It is a YA contemporary romance. As I announced earlier this week, OC Me will be available as a free download on kindle from today (10-16-14) until Saturday (10-18-14). Use the link below to take you directly to my book. Check that it's still free - the hours are based on Pacific standard time. Please share widely - I'd love to get this book in as many hands as possible. It is probably most suited for readers 15 and up. While I wrote OC Me for the young adult audience I've been delighted to be reminded that the young adult audience doesn't appear to have an age cap - I've heard from readers in their 20's, 30's, 50's and 80's. I'd love to hear from you too. If you read OC Me, please consider leaving an honest review for me on Amazon or Goodreads. By sharing your experiences you can help other readers decide if OC Me is the right fit for them and help me to grow in my writing.